Up the winding hill above the heat of Kingston to a white marker in the road, we were led on a downward path that ended at a gate surrounded by greenery, flowering plants and fruit trees. The fresh cool air of Irish Town at 9am awakened all six senses, including the one that foretells of a good time. 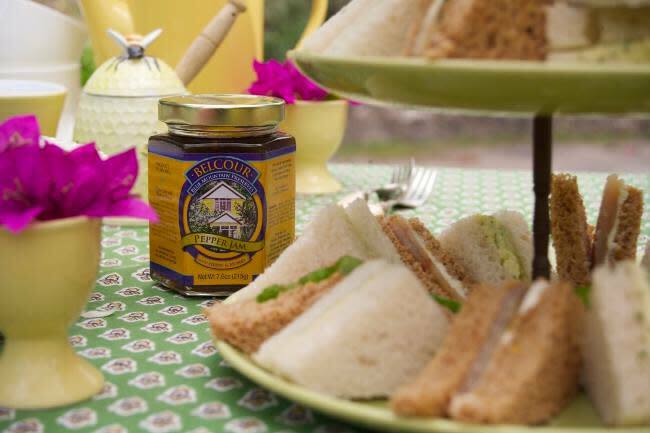 This was our introduction to Belcour Estate, the home of Belcour Preserves. After brief introductions to Robin Lim Lumsden, her husband Michael and puppy Aimee we ventured into the house, a charming English style cottage with the coolest shades of purples and blues interrupted by delicate china patterns and colourful Jamaican art. Robin ‘s eyes lit up with passion as she described the range of products belonging to the Belcour brand, which includes preserves, marmalade, chutneys, sauces and honey. While pouring over the pages of her cookbook, she ran through her family history, a menagerie of cultures from Singapore, China, England and Jamaica. That in mind, it was no surprise to discover that the expertly photographed images in her book each reflected a piece of her heritage and a fusion thereof. Several pages later, we were led on a tour of the property, with a cup of Blue Mountain coffee in hand and an energetic shitzu tour guide. 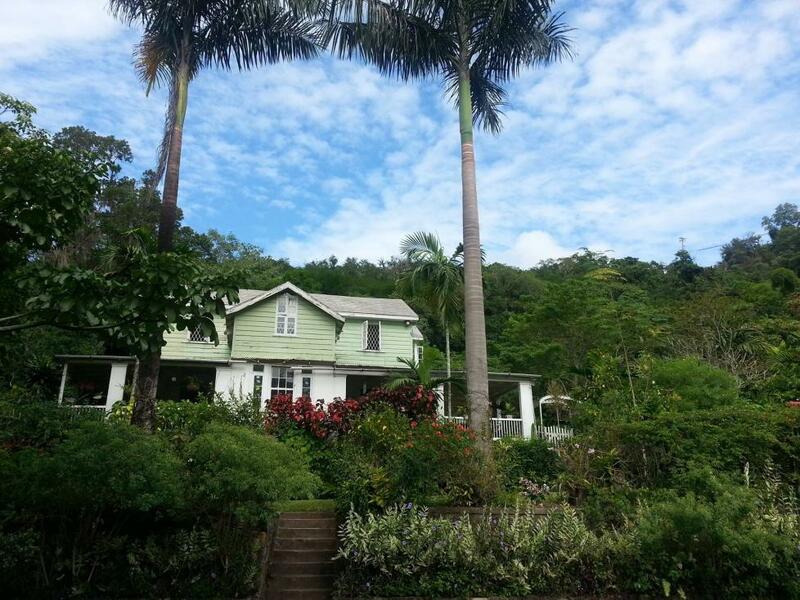 Belcour is located on 7 acres of land of an 18th century coffee farm, throughout which there is a river, several fruit trees and countless species of tropical flowers and 75-colony strong apiary. Back inside, the table was set for what would be an unforgettable breakfast. One by one dishes were brought to the table, preceded by aromas that danced out of the kitchen. The meal began with guavas stewed in sugar and spices, the ideal accompaniment to light creamy yogurt, topped with sliced bananas and a drizzle of homemade Belcour honey. A traditional Jamaican meal with African roots followed, Mackarel Run Down, a combination of the salted fish with vegetables and herbs cooked down in coconut milk, served with Jamaican ‘food’, boiled bananas and flour dumplings. The pages of Robin’s book came to life when her Ackee quiche was presented. Ackee, the fruit used in Jamaica’s national dish, was added to unusual pairings like parmesan cheese and parsley. Before long we were all full, having washed it all down with freshly squeezed orange juice and many glasses of laughter. The feel of several people from varying backgrounds gathering around a decades old mahogany table was magical. Over plates scraped empty we engaged in conversation about how this very menu was the personification of Jamaica, a picture of Robin’s multicultural heritage and one that every Jamaican shares. Run down with European cured meats, West African ackee in a French quiche, dumplings from China and honey from Jamaican bees. It was the real Jamaican food experience. Packed with goodies bags of Belcour Preserve products like pineapple jam, five fruit marmalade, honey and coffee rub we said goodbye to our new friends, though it was said with the sentiments of ‘soon come’. 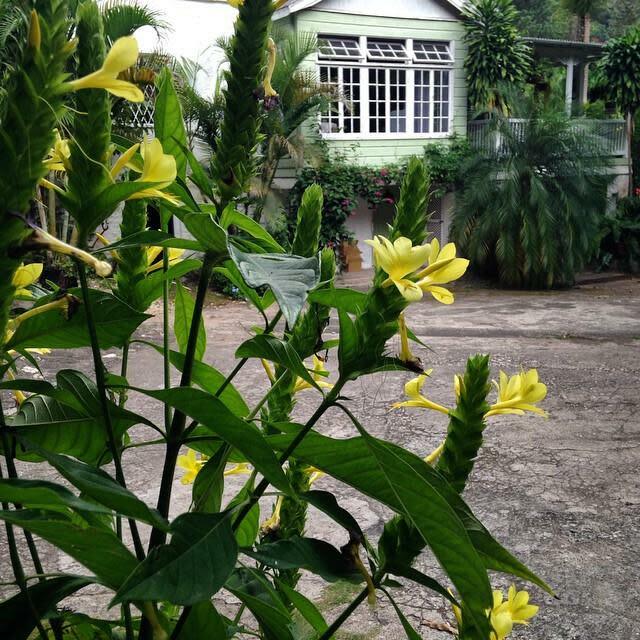 Evident everywhere on the property, in their home and in their products is the warmth of Jamaica that only visitors to the island and locals know. An unassuming sticker on a cabinet drawer near the guest restroom read ‘Do what you can, where you are, with what you have!’ Indeed they have done just that. For more information on Belcour Preserves visit their website.